Jen, of DeckledEdgeBindery, submitted this wonderful book to our third book swap. 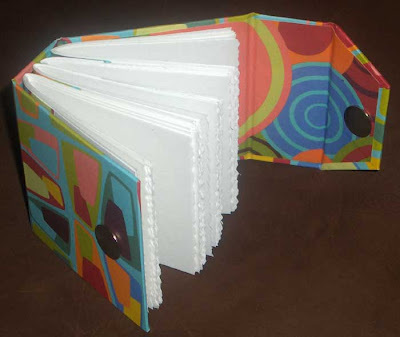 This little book is bound into its own little box and covered with fabulously fun paper. 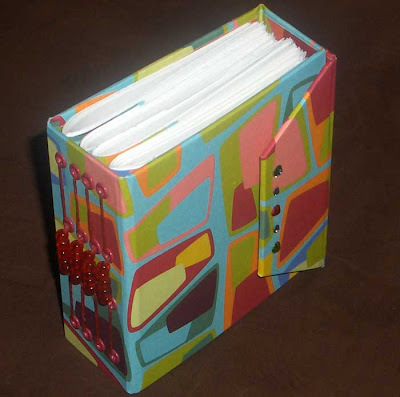 The pages are bound through the spine and accented with eyelets and little red beads. There are even some glittery little bits on the front. The wrap-around box closes with a magnetic fastener. Visit DeckledEdgeBindery.Etsy.com to see Jen's other work. yay! this is the book i got. i love the magnetic closure and the colors are so fun. thanks!